I look forward to every weekend for our family bonding. Eating out, exercising together, going to the mall or simply staying at home to watch their favorite movies/TV shows are just a few of the activities we love to do. As much as possible, I also make time during weekdays to make sure I spend quality time with my kids and get to catch up with them. They are growing up fast and I don’t want to miss any of it, especially their childhood. They are so precious to me. Luckily, I can source information about different events as a blogger mom before they even happen. I really look forward to and take advantage of functions where I can have fun and bring my kids along with me so we can enjoy the perks together. I’m truly grateful for all the opportunities and blessings I have received ever since. I and my two sons Elijah and Ethan had the chance to have an extended celebration at the SM Kids’ City on September 16. We stayed at EDSA Shang for my birthday, so SM Megamall was just stone-throw away. It was super fun and I was very excited for this extraordinary mall experience. The Event Center at the Lower Ground Floor of Mega A was transformed into a mini-city. There were several booths where both kids and moms could enjoy and experience. 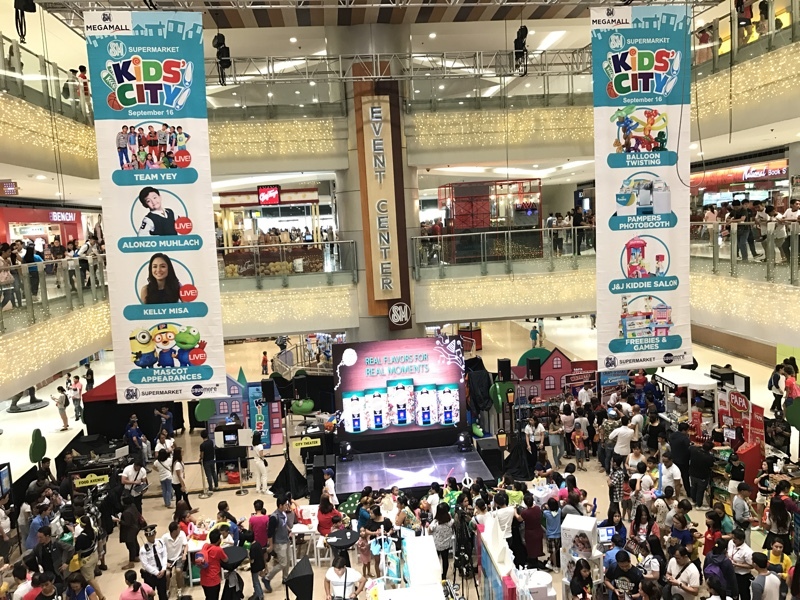 SM Kids’ City has been the biggest kiddie party in the metro malls including SM Southmall, SM Fairview, SM Bacoor, SM San Lazaro and SM Megamall. It’s been touring around since August, and good thing I didn’t miss it. September 16 was the last leg, and it was full of surprises! Celebrity guests Team Yey, Alonzo Muhlach, Alvin Patrimonio and Kelly Misa graced the party. There were games and playground setup for both the kids and kids at heart. Purefoods Star Hotshots was there to entertain us. Oh, this booth is so pretty! Mommies and daughters had some cool makeover sessions at the J&J Kiddie Salon. Gru and Minion Stuart were very accommodating and the kids love them! There were different fun rides, too. It was as if we’re in a carnival or theme park with all merriments in every direction. Our favorite part was the balloon twisting demo! Just like in every kiddie party, where my most awaited moment would be the performances like when clowns do magic, I was equally amazed as my sons were. And seeing my kids beaming with interest and happiness is priceless. We didn’t have to worry about getting famished even if we stayed for hours because there were special deals and even free food! Indeed, that was the biggest kiddie party we have ever been to! ‘Til next time! Visit http://www.smsupermalls.com website and Facebook page @smsupermalls to know more about their upcoming events. Hope to see you there!